Do you think Google will ever implement a native unified inbox solution? I like Blackberry solution, but dont want a Blackberry. You have Hangouts that unifies sms and Hangout messages but it doesnt work as well like Google messenger. But after that its nothing... Just multiple apps and multiple places to check them. or BB solution. Theres even built indicators of new messages for quick glancing. Over more than a couple of decades of writing and using software, I've come to a conclusion. A "do everything" app is really a do everything poorly" app. Microsoft Works does everything Microsoft Office does - terribly. An app that does email, SMS, Facebook, Hangouts, Instagram, etc., etc.? Probably be about 10GB and eat 3GB of RAM - just to check an email? No thanks. Pressing 4 buttons isn't that difficult, and I can check an email while Maps is giving me driving directions. I would believe that if Blackberry has the exact thing . You're saying that if Blackberry and Microsoft came up with terrible ideas, someone should do the same thing for Android? Hub is more than a unified inbox. It is a unified outbox (allows you to compose outbound messages, social media), and calendar just to name a few. Peak and flow in and out. Once you use it, you get it. THIS. For the love of god. I recently switched from a BlackBerry Z10 to a Galaxy S5. The S5 is bigger, faster and flashier than the Z10... BUT, when it comes to messaging, typing... any communication functions really, the S5 is a piece of fossilized garbage in caparison to the features and ease of use of the Z10. I almost regret buying the thing. 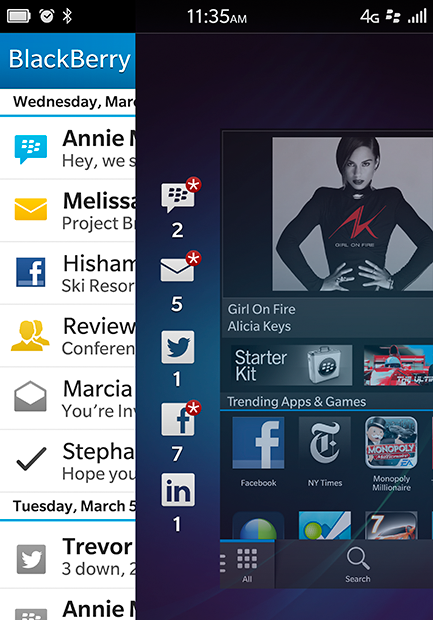 It's really very logical to have all of your communications listed in one place (like the BlackBerry Hub), rather than having to constantly switch between different apps that have different UIs and different rules for doing things. How do I clean up my inbox? Why does email from my trash go back to my inbox? How do I block emails on my work Outlook inbox on weekends?